There’s no denying that the beach holds a special place in our hearts. The sensation of sand between toes; the sharp, fresh fizz of cool waves splashing on sun-warmed skin; the salt-scented sea breezes blowing away the cobwebs… All things coastal combine to stir the soul and quicken the pulse. We all want to be beside the seaside (at least for some of the time, anyway), whether to swim, explore rockpools or snorkel; walk, paddle or surf; or simply to sit, stare and listen to the magnificent ocean. And you might not think it immediately, but we’re in a privileged position to live on an island – with shores aplenty. Okay, so the UK might not rank with the Bahamas or Maldives on your beach wishlists, but Britain has some absolute corker chunks of coastline, some with sand so white and shallows so azure that, on a sunny day, you’d have to pinch yourself to belief you hadn’t gone abroad. Admittedly, some coastal parts of our isle are prettier than others. But the UK is fairly small, in the grand scheme of things, so it’s easy to access a stunning seascape without too much trouble. We have farmers, land-owners and the good old National Trust to thank for letting the Great British camping public share some of their coveted coastal spots – if only to be able to call these campsites ‘home’ for one or two nights at a time. To spend a day on the beach and have an easy walk back to camp, where you can watch the sun set over the sea of an evening, and then to throw open the tent flaps the next morning to an oceanic vista makes a magical trip indeed. And, although campsites in valleys, beside rivers and lakes, and woodland campsites offer wonderful outdoor experiences, there’s something unbeatable about pitching beside the sea. A little slice the Mediterranean can be found on the Assynt Peninsula of Scotland’s West Coast. When the sun shines down on the intimate beach beside this campsite, the soft sands shimmer white and the sea, well, it really could be the Mediterranean. 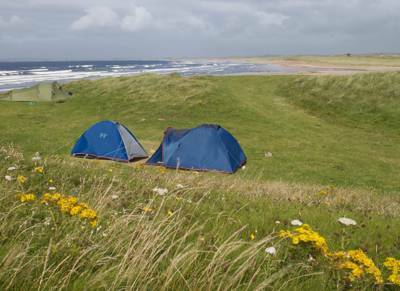 The price you pay for pitching just 100 metres from the water at Clachtoll Beach is exposure to the strong winds that can whip up over the sand dunes, so do bring a sturdy tent along. This tiny crofting community on the western coast of Lewis in the Outer Hebrides seems like the last place on earth. And that, of course, is the attraction, since the only thing to disturb the peace is the sound of the waves on the beach. The breathtaking sunrise over the waters of the bay is another moment to cherish long after you’ve gone home to tell your friends all about your stay at the end of the earth. Just a short ferry hop from the Mull of Kintyre sits the Isle of Islay – one of Scotland's finest whisky regions. The west side of the island is home to Kintra, a working farm that just happens to have great beach frontage fringed with grassy dunes. You can shelter down in one of the dips or pitch the tent up high if you want that real wind-in-your-hair, salt-on-the-skin feel. The bonus for the brave is unrestricted coastal views. ‘Away from it all’, ‘a wonderful sea view’, ‘an idyllic location’ and ‘well-maintained’ are all terms that can be fairly applied in a bid to describe Cae Du. But it doesn't seem enough. If all you want from your camping break is a sea view and to escape from the hustle and bustle, then this is the perfect place to unwind to the rhythms of the waves and the tides. Three Cliffs Bay is indisputably one of the finest beaches on the Gower Peninsula, with an almost round sandy beach encircled by unique rock formations. It's a distinctive silhouette, which has let to claims that this is the 'best view in Wales'. As luck would have it, a campsite perches on the high ground behind the beach, quietly taking it all in. But the beauty and majesty of the real thing has to be personally experienced. Just don’t forget your camera. This site is all about the panoramic backdrop: Atlantic waves undulating onto puzzling rock formations, heather-covered coastal landscapes, a sweeping curve of sand at nearby Pereglis Beach, and that night sky – an awe-striking bedazzlement of stars illuminating the blanket of sky above you. The journey to reach this westernmost of English campsites might be a lengthy one, but it’s worth it to holiday – with campfires – on this spectacular archipelago. From its dip within the valley, Tregedna Farm is surrounded by countryside as far as the eye can see. Yet daily life here revolves around the nearby beach, Maenporth, which is one of the best-located beaches on Cornwall’s south coast. It’s a simple life at Tregedna Farm, but there’s plenty of room for ball games, bikes and kites, so kids remain suitably entertained during their stay. A campsite with it’s own private beach on Dorset’s fossil-filled Jurassic Coast? Yes please. The views are stunning, the fields spacious and the amenities at Eweleaze top notch: purchase delicious produce from the organic farm shop and bakery, and delicious meals from the various food stalls that pop up daily. Campfires are permitted and the direct access to small shingle bay with its shallow waters make this site a must-visit. Eweleaze Farm is only open in August, but has recently acquired a site just across the road for July camping, which even runs a shuttle service from the beach. Perched atop the Norfolk cliffs, Go Camping at Overstrand boasts lovely views across the sea and miles of sandy shore stretching out below. Kids can scramble down the cliffs to reach the beach while adults can access it by the more sedate routes leading from the adjacent car park. The North Norfolk Coast Path runs alongside this tents-only site, and a 40-minute walk along this takes you into the iconic seaside town of Cromer. Don’t forget to pack the buckets and spades.